Many people like to have their picture taken with the latest film star or minor celebrity, but me? I like my picture with real rarities. 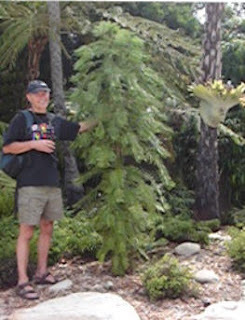 This is me with a Wollemi Pine. Discovered only a few years ago in NSW Australia, this tree was thought to be extinct. There are only a few hundred in the wild, and all in one group, but luckily for us - and the trees - they are easy to propagate. I could have afforded to take this one home ($60aus) but it would not fit in my case. I suspect it would do well here in the SW of Eire. I have met many remarkable trees in my time but this is the rarest. I just hope that whoever buys one of these does not put it in their garden in front of their window, only to have to cut it down several years later when it blocks the view as all trees will if planted in the wrong place. This specimen was photographed at Mount Annan botanical gardens near Sydney Australia in 2006.